With the start of the 2015 Honda Indy Toronto just around the corner, we thought this would be a great opportunity to talk about the rich history Honda has in motorsports. Like many great things, Honda’s racing history started with the childhood dream of one person. In March of 1954, then President of Honda, Soichiro Honda, issues a message to his workers declaring that his childhood dream was to be a motorsport champion and that after establishing a “stable enterprise with the finest precision equipment” he felt the company was ready for this step. He announced to his workers that it was his intention to not only participate in, but also win, the British Isle of Man Tourist Trophy (TT) races. Honda chose the TT race because it was most difficult, and he felt it symbolized the essence of motosport racing. By issuing his declaration in writing, he would not only generate interest for his company, but also help commit his workers to fulfilling his dream. Five years later, the Isle of Man TT featured its first Japanese team in a World Grand Prix race with four 125cc Honda motorcycles. The team took 6th, 7th, 8th, and 11th place in the race, as well as capturing the Manufacturers’ Team Award. In 1961, Honda took home its first championship when its rider, Tom Phillis, won the Spanish Grand Prix opening event. The same year, Honda was declared the double World Champion, claiming victories in two categories as well as earning the first victory for a Japanese rider in a World GP event, Kunimitsu Takahashi. 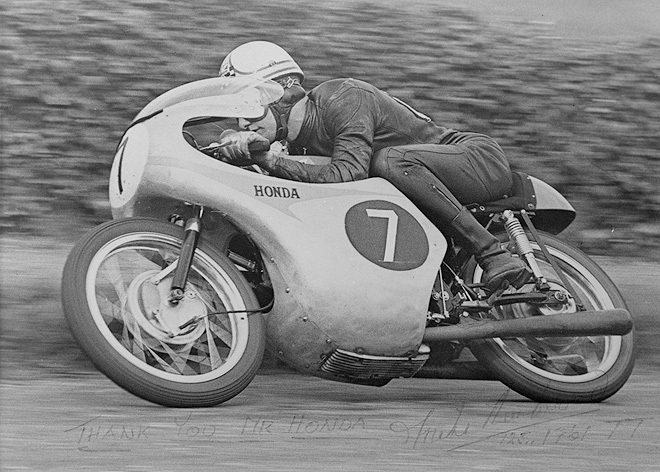 1961 was also the year Soichiro Honda’s dream was realized with a win by Mike Hailwood in the Ilse of Man TT. From the 1960s onward, Honda continued to dominate the motorcycle competiton scene worldwide and made significant advances in speed and power technology that would have lasting impact on the sport. While Honda turned heads in the motorcycle racing world, they were also making in-roads in other leagues. In 1963, the company entered Formula One racing and followed up two years later with its first F1 win at the Mexican Grand Prix. The company left Formula One in 1968, only to return in 1983 and go on to win six consecutive F1 Manufacturers’ Championships between 1985 and 1991. In 1993, the company opened Honda Performance Development, its North American racing company and the center for its high-performance programs. The company specializes in the design and engineering of racing vehicles for all classes of racing, from open-wheel, to sports car, and grassroots racing. The following year, the company entered the open-wheel CART series and their drivers took home victories in CART races each year between 1995 and 2001, including six consecutive CART Drivers’ Championships. In 2004, Honda claimed the “Triple Crown” of IndyCar championships with victories at the Indianapolis 500, 24 Hours of Le Mans and the Monaco Grand Prix races. 2009 marked the first year Honda Canada Inc. took on title sponsorship of the Indy event in Toronto after signing a multi-year agreement with Andretti Green Racing, the owner of the former Grand Prix of Toronto. Since then, the event has grown from just a competition weekend event to a full-fledged festival that is anticipated by the City of Toronto and racing fans alike every summer. This year’s event features a full length Indy Car race on both June 12th and 13th .Off-track, spectators can take advantage of food and craft beer festivals, as well as various racing related events throughout the entire weekend.